French bulldog is the middle sized dog having non-athletic traits. It is often mistaken with the English bulldog and Boston terrier. It is a miniature form of bulldog with huge bat ears. You’ll feel that the ears are chopped, but it is not the reality. The structure of head is flat and this muscular dog has flat body. The colors of dogs include varieties in white and fawn color. The average weight of dogs is 25 lbs. Personality: French bulldogs are companion dogs having even temper. The dog is highly suitable for single person and loves individual care by the owner. It doesn’t bark much, but finds actual cause of excitement from the fun with its parents. Living: French bulldogs can happily live in any kind of housing. The breed is actually suitable for urban life as there is not much space required to keep them. They can be easily accommodated in small apartments or houses. Frenchies don’t require too much food and can eat anything well. They should be kept clean, especially the face due to wrinkles on it. It has a flat face and nose due to which the dogs usually snore while sleeping. They can do anything to catch your attention. History: In the early phases of 1800s, the English bulldogs were taken by lace workers to France and they were mated with the local breeds. This breed was mini form of bulldogs and attained bat ears with a flat face. The dogs grow quickly and established a great companionship with their masters. 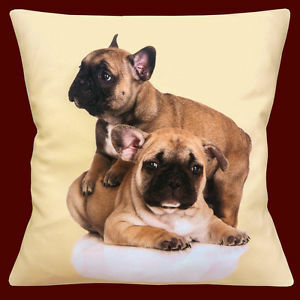 English people were happy to perpetuate this new breed and named it as French bulldogs. These dogs are fashionable and even kept by celebrities. In early phases of 1900s, Frenchies were considered to be the dogs kept by royal society and the breed still has popularity due to their cute structures and loving nature.